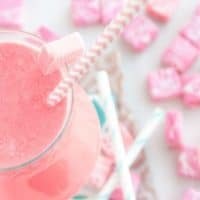 This Lightened Up Pink Starburst Cocktail is a health-conscious drink that tastes just like a Pink Starburst… without all the wrappers! Girl, you know I’m all about a yummy cocktail, right? Make sure you’re keeping your cocktails as light as possible with my free tips! Ok, so this is total deja-vu here. I’ve been here before. 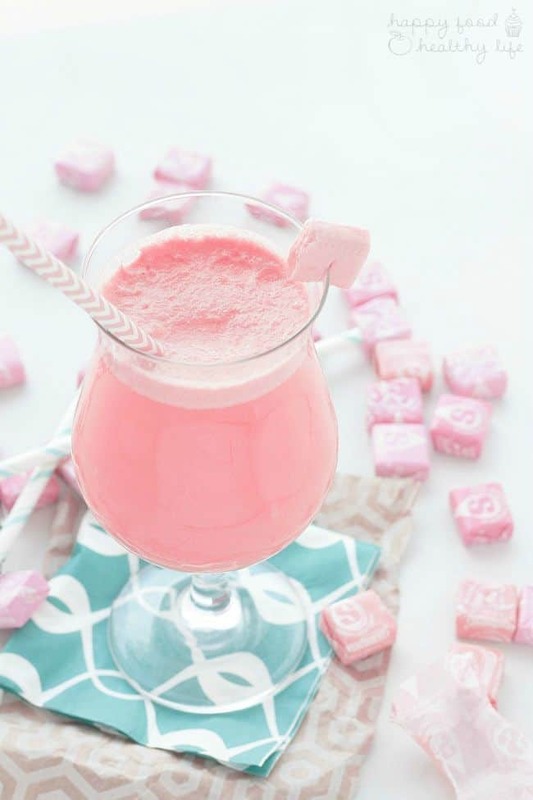 Pink Starburst Cocktail – totally sounds familiar, right? Could be because it’s my most popular recipe in the entire 3+ years Happy Food Healthy Life has been alive. In fact, it’s been pinned on Pinterest over 160,000 times! 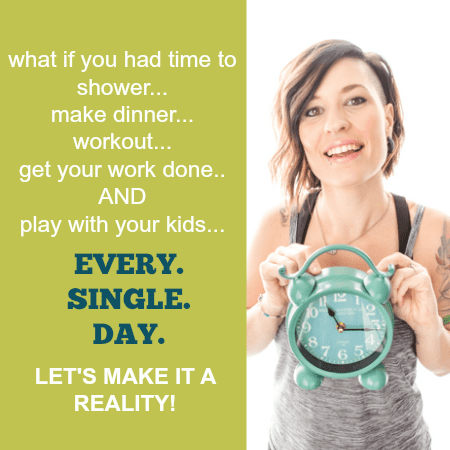 So if I’ve already made it and everyone loves it, why am I making it again? Well, I knew I could make it better for you. You deserve the best of the best, and this time I amped up the alcohol and cut down on the sugar – total win, right?! You’re going to love this one even more! 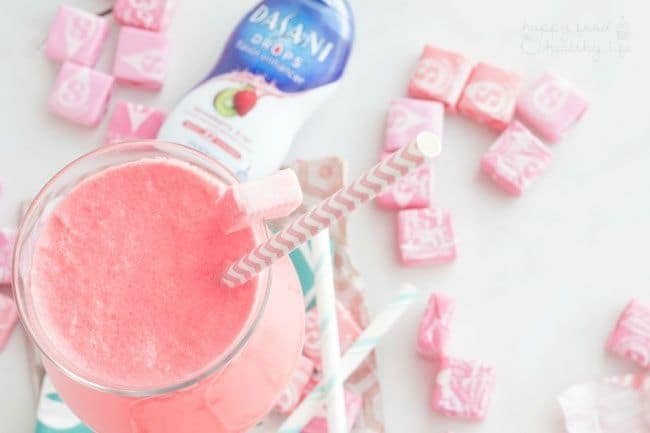 So I know summer’s officially over, but I’m kind of a sucker for a sweet and fruity beverage, any time of the year. And to be honest, it’s still 80 degrees where I live for at least another few weeks. And until it all changes to hoodies and slippers, I’m going to soak it up with this drink in my hand. And to be honest, I will probably continue drinking it throughout the winter months. You kind of can’t help it with how easy it is to make! See? You probably caught a glance of those Dasani Drops, and if you’re anything like me, you thought they were total genius, right? Talk about a punch of flavor without having to add a sugar-filled mixer to your cocktail. To be honest, there’s so much flavor that you’d never guess this was an adult drink! Now, I’m not saying that drinking is necessarily healthy, but I am definitely an advocate of enjoying the things that you love, and for me and many others, a glass or two is something I enjoy. The reality of the matter is that calories add up very quickly when you are drinking. Thankfully, I have a few tricks up my sleeve. Let me tell you a little more about my cocktail hacks to make them lightened up a bit. Drink Wine. It’s lower in calories. Once you have more than two drinks, you’re already in “unhealthy” territory. If it’s a simple social gathering and not a wild night out, the best thing will be to cut yourself off after two. My favorite trick for keeping calories low is using flavored water drops like Dasani Drops. I’ve tried them in Pink Lemonade (perfect for a whiskey sour), Strawberry Kiwi, and Mixed Berry. Just mix up a glass of water with a few squirts of the drops and add your favorite liquor. Rum, whiskey, and vodka are the best with the mixes. Also, how easy is it to just drop one of these bad boys into your purse for the night? Trying to fit a huge bottle of a skinny mixer into your little clutch isn’t gonna be nearly as easy! Hey, maybe you’re not into cocktails. No worries! Add a little more of all ingredients besides the vodkas and you’ll be good to go. Or if you just want a refreshing drink, add a few squirts to your water glass, and you’ll be enjoying your flavored water in style… of course with a cute paper straw to match! Do you have any secrets for lightening up your cocktails? Tell me in the comments! 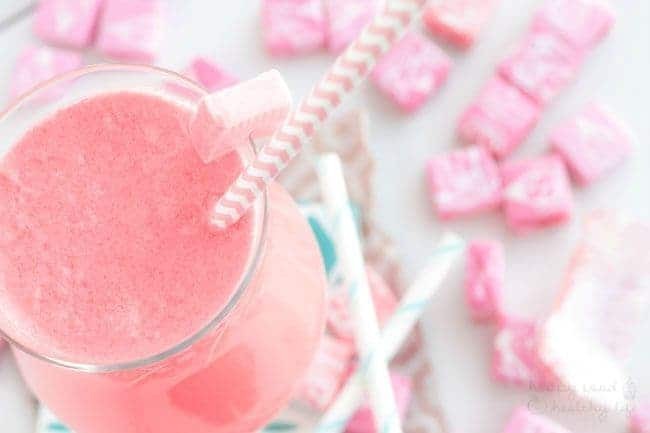 Love Pink Starbursts? Let’s make it into a COCKTAIL!! Don’t forget to get my tips first so you can make even more drinks lightened-up just like this one! In a cocktail shaker, combine ice, vodkas, almond milk (or cream), kiwi-strawberry flavoring, and orange juice. Make sure the lid is on tight and shake well. Pour into a 12 ounce glass. Top with a splash or two or diet lemon lime soda. Garnish with either a fresh strawberry or a pink strawberry starburst. THIS POST IS SPONSORED BY DASANI. THANK YOU FOR ALLOWING ME TO CONTINUE CREATING GREAT CONTENT FOR YOU BY SUPPORTING PARTNERSHIPS WITH SUPER AWESOME BRANDS THAT HFHL LOVES TO WORK WITH! AS ALWAYS, OPINIONS REMAIN 100% MY OWN. This is so fun! Cannot wait to try it! You are going to love it! Thanks Rachel! I think I need to try these Desani drops (and this cocktail) – nice!! What a cute idea for a better-for-you drink! Delicious! I used So Delicious French vanilla flavored coconut creamer and SweetLeaf stevia kiwi strawberry drops to make it a little healthier along with Trop50 to cut out some of the sugar & calories of regular OJ. Thanks for a great base cocktail!